These pages have links to high resolution 360 degree panoramas from the Cascade Range in Washington State in several formats. Some panoramas are labeled, perhaps obsessively so. I’ve now added all my older labeled panoramas that were originally intended to be printed in booklet form. They are here. If you want to skip the stuff below, just click on the links to the left. I’ve added a table with links to almost all the panoramas on this site, all formats. About 60 locations so far. I hope these images will give you a feeling for the views from a number of summits. HD View QTVR and Photosynth panorama formats allow you to navigate right - left , up - down, and zoom in and out using the mouse and keyboard. You can pan around the entire horizon, zooming in and out when you want, almost as if you were standing on the summit looking at different features. If you do not have the required browser plug-in installed, you should be guided to the install site. There is a workaround for Mac users and others who do not wish to install the DevalVR plug-in on the help page. 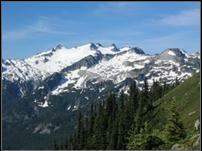 The first panoramas from Cascade peaks I did were just for me. They were field guides with peak labels included to compensate for the fact that I can't remember names. Friends at the USFS Cle Elum Ranger District encouraged me to make a few pans for the two remaining fire lookouts in the district, and then one thing lead to another. Better cameras for the purpose, and better software keep allowing me to do things I thought not possible. An excellent question! Too bad I don't know the answer. One of my goals has been to document the Cle Elum Ranger District north of I-90 from a large number of vantage points within and along the boundary of the district. Along with the labeled panoramas in .pdf format from each of these locations, these images may be a useful tool for the district. At a minimum, I'll try to make this a convenient resource for my friends in the Forest Service. Just the nuts and bolts, no superfluous verbiage — like what I've just written. To view the DevalVR based panoramas, the DevalVR browser plug-in must be installed. Simply clicking on the file should lead you to the install page. You need administrator privileges to so this, and you need to click ‘OK’ to give permission to install when you are prompted to do so. Once the DevalVR viewer loads the image file, click the little slide out control at the left lower corner and try the full screen button. Try the magnifier too; it's very slick. The new compass feature is a big help; thanks Fiero! If you can’t view the Deval VR files I’ve added a few caveats on the help page here.